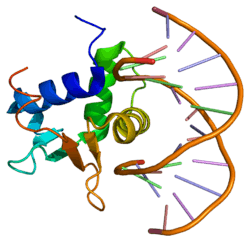 ETS domain-containing protein Elk-4 is a protein that in humans is encoded by the ELK4 gene. This gene is a member of the Ets family of transcription factors and of the ternary complex factor (TCF) subfamily. Proteins of the TCF subfamily form a ternary complex by binding to the serum response factor and the serum response element in the promoter of the c-fos proto-oncogene. The protein encoded by this gene is phosphorylated by the kinases, MAPK1 and MAPK8. Several transcript variants have been described for this gene. ↑ Giovane A, Sobieszczuk P, Mignon C, Mattei MG, Wasylyk B (Mar 1996). "Locations of the ets subfamily members net, elk1, and sap1 (ELK3, ELK1, and ELK4) on three homologous regions of the mouse and human genomes". Genomics. 29 (3): 769–72. doi:10.1006/geno.1995.9938. PMID 8575773. 1 2 "Entrez Gene: ELK4 ELK4, ETS-domain protein (SRF accessory protein 1)". ↑ Chai Y, Chipitsyna G, Cui J, Liao B, Liu S, Aysola K, Yezdani M, Reddy ES, Rao VN (Mar 2001). "c-Fos oncogene regulator Elk-1 interacts with BRCA1 splice variants BRCA1a/1b and enhances BRCA1a/1b-mediated growth suppression in breast cancer cells". Oncogene. 20 (11): 1357–67. doi:10.1038/sj.onc.1204256. PMID 11313879. ↑ Hassler M, Richmond TJ (Jun 2001). "The B-box dominates SAP-1-SRF interactions in the structure of the ternary complex". EMBO J. 20 (12): 3018–28. doi:10.1093/emboj/20.12.3018. PMC 150215 . PMID 11406578. ↑ Zhu C, Johansen FE, Prywes R (Sep 1997). "Interaction of ATF6 and serum response factor". Mol. Cell. Biol. 17 (9): 4957–66. PMC 232347 . PMID 9271374. Sharrocks AD, Brown AL, Ling Y, Yates PR (1998). "The ETS-domain transcription factor family". Int. J. Biochem. Cell Biol. 29 (12): 1371–87. doi:10.1016/S1357-2725(97)00086-1. PMID 9570133. Wasylyk B, Hagman J, Gutierrez-Hartmann A (1998). "Ets transcription factors: nuclear effectors of the Ras-MAP-kinase signaling pathway". Trends Biochem. Sci. 23 (6): 213–6. doi:10.1016/S0968-0004(98)01211-0. PMID 9644975. Dalton S, Treisman R (1992). "Characterization of SAP-1, a protein recruited by serum response factor to the c-fos serum response element". Cell. 68 (3): 597–612. doi:10.1016/0092-8674(92)90194-H. PMID 1339307. Price MA, Rogers AE, Treisman R (1995). "Comparative analysis of the ternary complex factors Elk-1, SAP-1a and SAP-2 (ERP/NET)". EMBO J. 14 (11): 2589–601. PMC 398373 . PMID 7540136. Dalton S, Treisman R (1994). "Characterization of SAP-1, a protein recruited by serum response factor to the c-fos serum response element" (PDF). Cell. 76 (2): 411. PMID 8293474. Janknecht R, Hunter T (1997). "Activation of the Sap-1a transcription factor by the c-Jun N-terminal kinase (JNK) mitogen-activated protein kinase". J. Biol. Chem. 272 (7): 4219–24. doi:10.1074/jbc.272.7.4219. PMID 9020136. Janknecht R, Hunter T (1997). "Convergence of MAP kinase pathways on the ternary complex factor Sap-1a". EMBO J. 16 (7): 1620–7. doi:10.1093/emboj/16.7.1620. PMC 1169766 . PMID 9130707. Stein B, Yang MX, Young DB, Janknecht R, Hunter T, Murray BW, Barbosa MS (1997). "p38-2, a novel mitogen-activated protein kinase with distinct properties". J. Biol. Chem. 272 (31): 19509–17. doi:10.1074/jbc.272.31.19509. PMID 9235954. Mo Y, Vaessen B, Johnston K, Marmorstein R (1998). "Structures of SAP-1 bound to DNA targets from the E74 and c-fos promoters: insights into DNA sequence discrimination by Ets proteins". Mol. Cell. 2 (2): 201–12. doi:10.1016/S1097-2765(00)80130-6. PMID 9734357. Kamakura S, Moriguchi T, Nishida E (1999). "Activation of the protein kinase ERK5/BMK1 by receptor tyrosine kinases. Identification and characterization of a signaling pathway to the nucleus". J. Biol. Chem. 274 (37): 26563–71. doi:10.1074/jbc.274.37.26563. PMID 10473620. Chai Y, Chipitsyna G, Cui J, Liao B, Liu S, Aysola K, Yezdani M, Reddy ES, Rao VN (2001). "c-Fos oncogene regulator Elk-1 interacts with BRCA1 splice variants BRCA1a/1b and enhances BRCA1a/1b-mediated growth suppression in breast cancer cells". Oncogene. 20 (11): 1357–67. doi:10.1038/sj.onc.1204256. PMID 11313879. Hassler M, Richmond TJ (2001). "The B-box dominates SAP-1-SRF interactions in the structure of the ternary complex". EMBO J. 20 (12): 3018–28. doi:10.1093/emboj/20.12.3018. PMC 150215 . PMID 11406578. Mo Y, Ho W, Johnston K, Marmorstein R (2002). "Crystal structure of a ternary SAP-1/SRF/c-fos SRE DNA complex". J. Mol. Biol. 314 (3): 495–506. doi:10.1006/jmbi.2001.5138. PMID 11846562.